The thing with marketing – in fact anything to do with business – is that you cannot rest on your laurels. 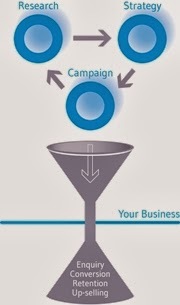 Things change – you need to measure the success of your marketing and relate that to your original Research and Strategy, sometimes you may also need to refine your Campaigns in order to funnel a more aligned customer into your business. This can be done by returning to the top of the Visionary Marketing Process and considering your Research – this time conducting internal Research with your customers. By asking your customers a couple of simple questions you will be able to determine a lot about the success of your Campaigns. Combine this with comparisons to sales made you will get a really good snapshot of the type of customer that you have in your business purchasing (or even just browsing); you will understand what worked in your Campaigns and be able to make relevant and pro-active changes to your own process. • What parts of my marketing is working for me? • Who is my current target audience? • What didn’t work in my marketing campaign that needs to be changed or scrapped? • Did I reach my ideal client? • What gaps are there in my marketing Strategy that I need to fill. Obviously here you also need to analyse traffic information from your website and also social media analytics to help create a big picture view of the results of your marketing.